Sureline Broadband now employs seven people at the Madras business, which covers the entire Central Oregon area. 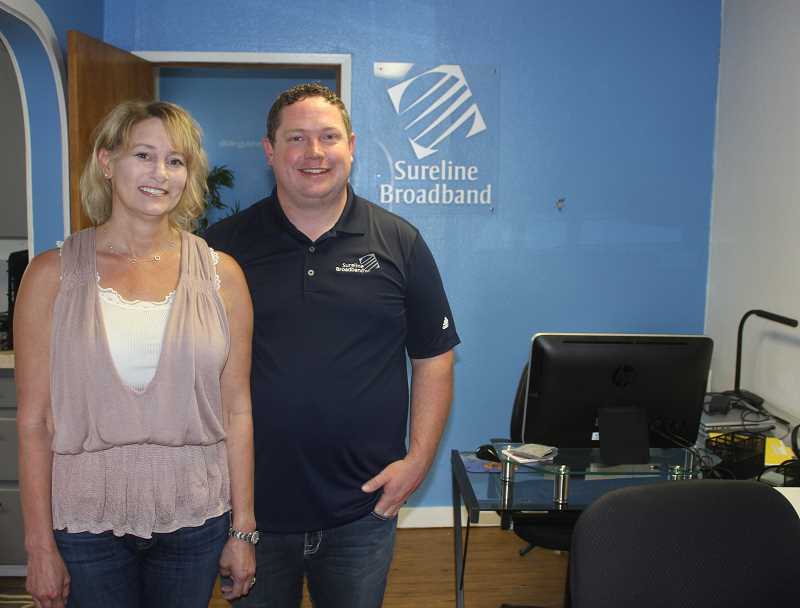 Sureline Broadband, owned by Shelly and Josh Richesin, of Madras, purchased Jefferson Broadband on June 15, and are busy upgrading equipment with faster technology. Under Sureline, Josh Richesin said, "We will have more towers. Changes will include faster speeds, a choice of more packages, voice-over IP phones, cost savings, and we will expand coverage to Gateway. Our current customer base will have more options for towers, thus providing even better speeds, a larger backbone for redundancy, and availability to serve more customers." The business covers the Central Oregon area, south from La Pine to Gateway, Sisters to the west, and Prineville to the east. The Richesins have both worked as internet network engineers and security consultants for 15 years, doing a lot of work for banks, hospitals, and emergency and fire facilities. "We had an office in Terrebonne, but Josh grew up in Madras and wanted to move back, so we moved the office and have been here two years now," Shelly Richesin said. Madras High School is where Josh Richesin got his start in computer work. "I did work experience at Custom Computer Concepts, and helped set up the dial-up internet. That's where I met Dave Wollam," he said. Vaughn Skinner brought the first internet connection to Madras, then sold it to Keith Sherer and Wollam. When Sherer retired, Wollam and partner John Stubbe formed Jefferson Broadband, which they have now sold to the Richesins. "Dave wanted to sell, and wanted it to go to someone who was going to care about local customers – not a big corporation," Josh Richesin explained. Both Richesins have college degrees in networking and programing. She attended the University of Oregon, and finished her degree at Central Oregon Community College, while he did all his coursework through COCC. Josh Richesin worked for Bend Broadband and Quantum Communications in Redmond before they started their Sureline Broadband business, and Shelly worked as a consultant for Symantec, and several other businesses in the Willamette Valley. "It took us a long time to get to seven employees," Shelly Richesin said, noting that includes network engineers, office staff and field technicians who do installations. Coming full circle, the business just welcomed its first MHS student intern through the Oregon State University Open Campus program. They hadn't planned on the business to grow so quickly. "In the last year, we've quadrupled our customer base and 35 percent of those are commercial accounts," Shelly said. Sureline is in the process of installing its equipment onto more towers, where it leases space. "This is a very new technology. Google quit using fiber optics and started doing fixed wireless," Josh Richesin explained, noting Sureline is on about 30 towers in Central Oregon, and growing. "That puts customers on duel fiber feeds on the towers, and redundant connections, so that if one fiber is cut, the connection goes through the other feed. We pipe between the house and tower with a high-speed wireless radio," he said. "It provides fiber-like speeds without the expense of installing fiber at the house," Shelly Richesin added. She said they are working to become involved in the Madras community, and are both amateur radio operators and part of the state of Oregon Emergency Management communication system, and the Jefferson County Sheriff's Office Emergency Management team.